Full Circle Cleaning Powder gives you the power! Tear into the packet, add 32 ounces of warm or hot water and get a clean machine. 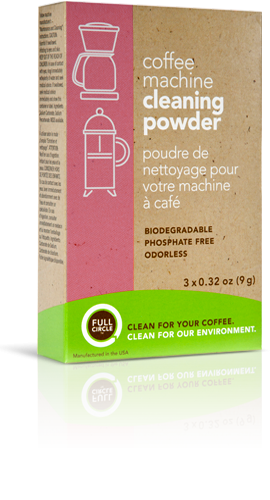 This special food-safe cleaner cleans away oily residue that can lead to bitter tasting coffee and unnecessary wear on your machine. So this one time, I went on vacation for two weeks and Kat did not clean the Technivorm KBG741 Coffee Maker. When I came back to the office it was grossssssss. Cautionary tale, do not let this happen to you. I make three pots a day and clean the coffee maker once a week. Your mileage may vary. Odorless is a nice benefit. It is also biodegradable and phosphate-free. Use it or lose it. Once a week works well for us.